Oregon Sea Grant has published a revised Quests book – The Oregon Coast Quests Book: 2013-14 Edition. Quests are fun and educational clue-directed hunts that encourage exploration of natural areas. In this self-guided activity, Questers follow a map and find a series of clues to reach a hidden box. The box contains a small guest book, a stamp pad, a unique rubber stamp, and additional information about the Quest site. Participants sign the guest book to record their find, and make an imprint of the Quest Box stamp in the back of their clue book as proof of accomplishment. Then the box is re-hidden for the next person to find. The location of the clues and box remain a secret so others can share the fun. Oregon Coast Quest clues and boxes stay in place year-round. 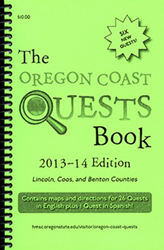 This new edition of the Oregon Coast Quests Book contains 26 Quests in three counties (Lincoln, Coos, and Benton), including six brand-new Quests and one in both English and Spanish.